My minister published this on his Facebook page and I found it very moving. This prayer of abandonment by Charles de Foucauld echoes what my husband said when we were talking about the Lenten ritual of abstaining from something or denying yourself a particular thing. He said "For Lent I'm just giving up." I waited and then laughed when I realized that was the end of the sentence. Yes, there's an admirable Lenten discipline- I'm just giving up! My friend Mary Andersen is with me and we're doing some computer exploration together. Check out her site: Mary Andersen Art or visit her blog and leave her a comment! Yesterday, we had a fun but cold Mardi Gras experience in Douglas, Michigan. We were delighted to stay overnight at the Sherwood Forest B&B. We had the winning bid at an auction fundraiser for the Saugatuck Dunes Coastal Alliance and really enjoyed our stay. We walked by Lake Michigan and it wasn't too cold. Beautiful, if you can appreciate a monochromatic landscape, which we do! This painting is pre 2004, I don't think I blogged it before. I always liked the strong contrast and shadows on it. I haven't painted flowers for a while but the promise of spring is enough to make a person want to use bright colors of paint! 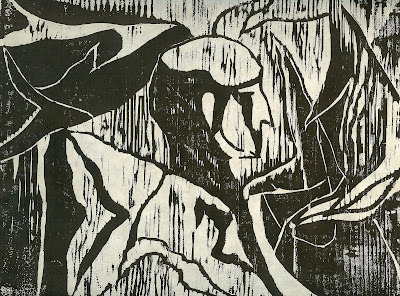 This is a block print I did of St. Francis back in the 70's during my time at Calvin College. I found this during a recent dig into an old folder. I almost didn't remember it. I guess I was intrigued by his story even back then. 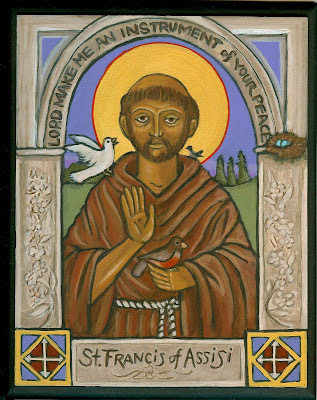 My recent St Francis icon is featured in a post on the Image and Spirit blog. It's great to have a webmaster! Arend also put on another hat and took my picture for a spot on the Biggby Coffee B-Happy Lounge where I'll be the featured artist in March. This really speaks to my heart and makes me want to DANCE (and travel). 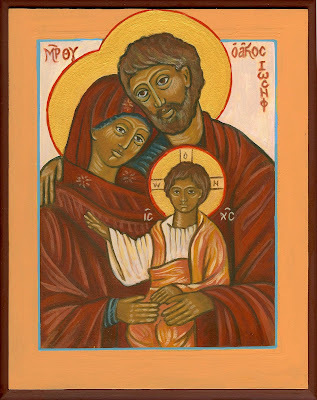 I researched and created this icon from many sources and through much painting and repainting, I developed a design that (to me) seems to reflect the Franciscan spirit. 'Writing' it was a real blessing. 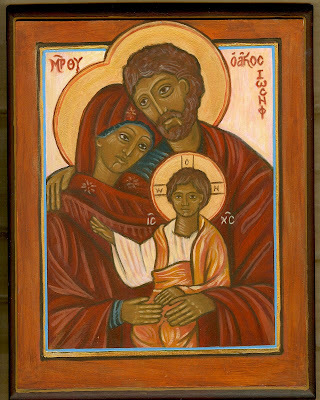 HOLY FAMILY - take two. The first (top photo) version of the Holy Family didn't feel very restful to me. There were lots of little details that were bugging me, so after hours of 'futzing' with all sorts of bits and pieces, this feels more complete and as good as I can do at this point (bottom photo). I thought it would be interesting to show something not totally successful and show how it was improved. My favorite part is the three hands together. It's what drew me to this piece. 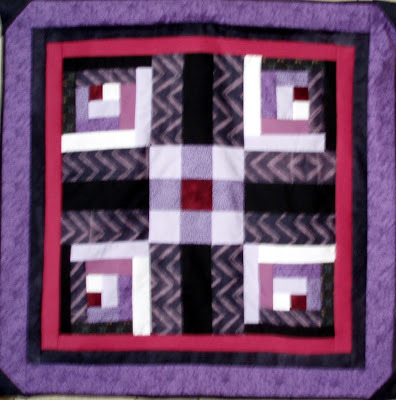 This icon also uses a pattern originating with Daniel Nichols. This piece was 'written' as a gift for the new Grand Rapids Catholic church of St Joseph the Worker. Daniel Nichols of Eighth day icons was kind enough to let me use the pattern he created. Icons traditionally begin with a traced image. Some iconographers create their own patterns. Even though it begins with the same pattern, each icon gets its own look. Whatever the source, writing icons is a process of connecting to the mysteries of faith. Peter Pearson in his book A Brush with God wrote "whether we are aware of it or not, we dance with God." 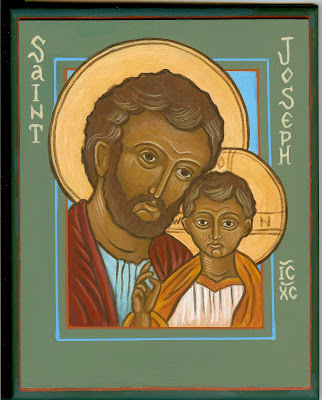 Contemplating the life of St. Joseph was a wonderful thing to do in the process of meditating during this process. What a complicated dance his life must have been! I bought a ruling pen and have been experimenting with making straight, clean lines. This is the first time I've achieved success with that! 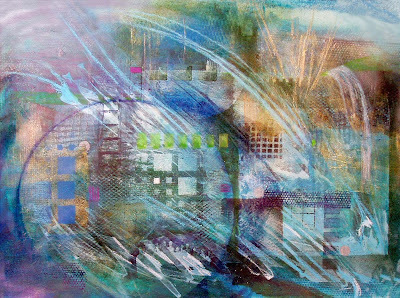 This piece was accepted into the First United Methodist Celebration show. In the Psalms, Higgaion is a word that means murmuring of the harp, or instrumental interlude, or meditation. That is what abstract and non-objective compositions are to me ~ a place to rest visually while sorting out the day. 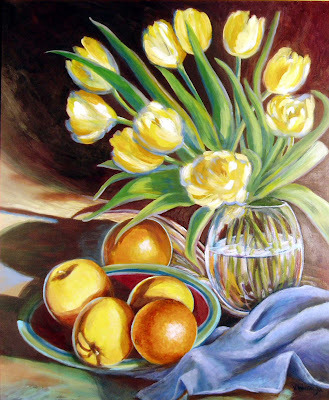 This piece was accepted in the Lowell Regional Arts Competition for 2009. My friend Mary E. Andersen got Third Place! ...if the creek don't rise! I heard from a friend who is in the middle of a long medical journey. It made me once again think of how fragile we all are. I laughed when she wrote: "It's hard for us to make any long range plans because the schedule is uncertain". If any of us had any sense of how small we are, we'd all have that feeling about making plans! It seems a little dramatic to add 'Lord willing' to everything, but what could be truer? Today it's 50 degrees in GR and the snow is melting (Yay!) so the phrase today would be "if the Good Lord's willing and the creek don't rise!" An update on my surgery, I now have crutches and can put some weight on my foot, but I still have to wear my storm trooper/cyborg boot for at least 3 more weeks. Once I can comfortably wear a tennis shoe, I can have the surgery on the other foot! 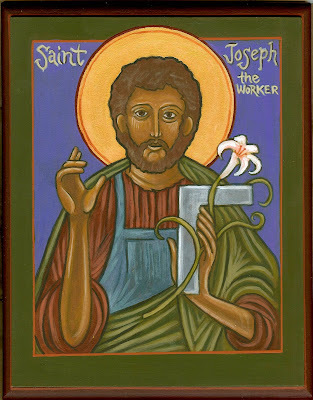 I'm continuing to do research for some icons of St. Joseph the worker (husband of Mary, earthly father of Jesus). The ones I like the best I found on a site called Eighth Day Icons by an Ohio iconographer, Daniel Nichols. http://www.eighthdayicons.com/index.htm His work is beyond my current level of skill, but very inspiring.